The first tenet of the Qualicum Institute is the foundation for all the rest. It sets the stage for sustainability, recognizing that we are subject to the physical and ecological laws and principles that govern the lives of all organisms. 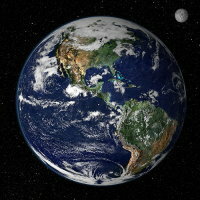 How anyone can believe, while looking at an image of the Earth from space, that we are separate from Nature and not dependent on the natural world for all of our needs baffles us for Nature is all we have. Everything we need for our social well-being, economy, indeed our very survival, comes from the ecosystems of the planet with but one significant exception: the energy that rains down on Earth each day from an average star we call the Sun, some 150 million kilometres (93 million miles) away. And yet, there are those who believe we don’t need ecosystems and the resources they provide. Fisher and Peterson in their book, The Environment in Economics: A Survey1 note that: “Man has probably always worried about his environment because he was once totally dependent on it,” implying we’re no longer totally dependent upon it. Kevin Schmiesing3, another economist, believes that “A commitment to the welfare of human beings takes precedence over a general devotion to the well-being of the Earth.” This is ridiculous, for without a healthy Earth, the welfare of human beings is moot. Comments such as these to the contrary, we are, indeed, a part of Nature, fully dependent on ecosystems and ecosystem services, including resources, and are subject to the natural laws and principles that govern all biodiversity on the planet. 1 Fisher, Anthony C., and Frederick M. Peterson. “The Environment in Economics: A Survey,” Journal of Economic Literature, March 1976, 1-33. 2 Solow, R.M. 1974. The Economics of Resources or the Resources of Economics. American Economic Review 64:1-14. 3 Schmiesing, Kevin E. “How not to protect the environment.” (Accessed 3 October 2007). Note: this link opens a new window.